The original layout (early 1st cent. BC) retains the typical plan of the "atrium style" house, based on the entrance-atrium-tablinum axis, sumptuously organized so that the guest would become aware of the host's social status immediately upon entering. Almost all of the rooms open onto the atrium. The roof has folds sloping inward (compluvium) to gather rainwater in a tub in the center of the floor (impluvium), and from here to the cistern below, from where it could be recovered. 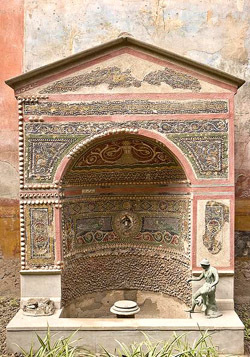 In the garden, the walls of the peristyle are richly decorated with frescoed landscapes and maritime buildings; use of the fountain-nymphaeum, covered with mosaics and decorated with sculptures, became widespread beginning in the middle of the 1st cent. AD.